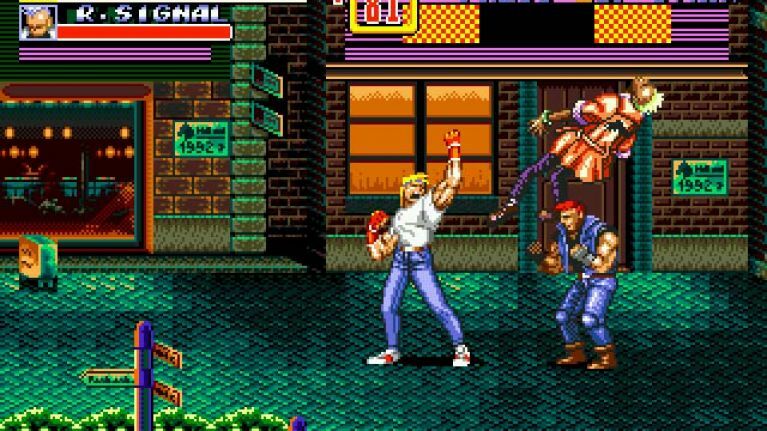 Released in 1992, the side-scrolling beat 'em-up Streets Of Rage 2 was one of those generation defining video-games when it was released on the Sega MegaDrive. Adapted from the Japanese game Bare Knuckle 2: The Requiem Of The Deadly Battle (which... that title... is insane), you picked from the hunky blonde dude, the beautiful lady, the big brute, or the little kid on skates, and you went through the city defeating the cronies of the big bad guy. It didn't always make sense - at one point, you seem to fight an actual alien dragon, and then a wrestler, and then a pair of overweight fire-breathing twins - but it didn't matter when it was this much fun. Well, you can't keep a good idea down for too long, and the folks at MakinGames (who are made up of former Rare employees, the folks behind Donkey Kong Country, Perfect Dark and GoldenEye 64) have announced their new game, Raging Justice. It tells the story of Nikki Rage and Rick Justice (oh, we see what you did there), as they attempt to clear the streets of crime, using just their fists, feet, and whatever else they can get their hands on. The game is set to arrive on PS4, Xbox One, Nintendo Switch, PC, Steam and Mac later this year, and we've got the first trailer for you to get all old-school excited by.